Description Our Hero has built a rocket belt... strap it on to leave the pond and explore the world. High five your friends (The Red Crabs!) as you fly! Power up and fly at amazing speed when you eat a Fire Fly. 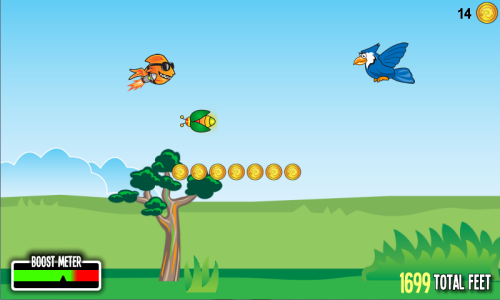 Gather Shrimp Coins as you fly farther and farther from the pond! Watch out! Eagles, Tree's, Rocks and Shrubs will kill you (unless you're powered up or using bonus items!). Break the record and fly farther and farther to unlock even more items! Click (or Click and HOLD) to thrust higher... release to fall to the ground at will. Your can run on the ground too!